Well-managed companies like to keep their costs down. 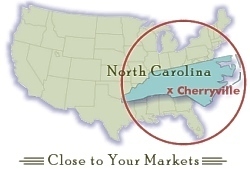 Cherryville Public Warehouse is your opportunity to save without sacrificing service to your customers. In fact, our combination of strategic location, superior service and online inventory management means you can improve your customer service and improve your bottom line. The sooner you call, the sooner you save! Our Online Inventory Management gives you all the control you need to stay on top of all your and receiving activity.